Universal Studios Hollywood shifts into high gear for the June 25 opening of Fast & Furious—Supercharged with the launch of Road to Fast, a dynamic campaign featuring a series of original images and an engrossing behind-the-scenes video, including interviews with the cast of its new thrill ride: Vin Diesel, Dwayne Johnson, Michelle Rodriguez, Tyrese Gibson and Luke Evans. A collection of six images, each featuring the stars of the ride depicted in a variety of action sequences, will be unveiled sequentially beginning today with a group shot of the characters racing alongside a Studio Tour tram. A lengthier, more complex look at the making-of this revolutionary new attraction, featuring insightful perspective and commentary from the cast and producers, has also being released. 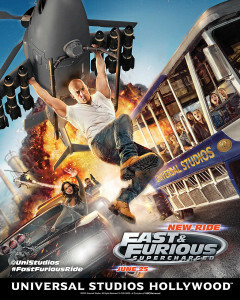 Fast & Furious—Supercharged is a technologically advanced, epic ride that reunites stars from the Fast & Furious series in a groundbreaking mega-attraction designed to catapult guests into the high-stakes underground world of street racing at perceived speeds in excess of 120 miles per hour. This high-octane ride is conceived as a new installment to the Fast & Furious franchise and will debut as the grand finale to Universal Studios Hollywood’s behind-the-scenes Studio Tour that can only be experienced at The Entertainment Capital of L.A. Eating competitors were crowned this past weekend at New York-New York Hotel & Casino in the 18th annual qualifying competition for the 100th Annual Nathan’s Famous Fourth of July Hot Dog Eating Contest in Coney Island, NY. 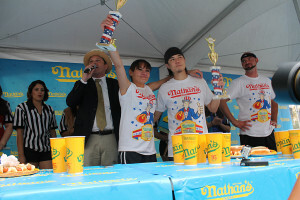 Matt Stonie and Michelle Lesco earned the title of Nevada Hot Dog Eating Champions securing a spot to compete in the legendary Coney Island competition on July 4. During the 10-minute challenge, Stonie earned top male honors, finishing 48 hot dogs while Lesco won the female division, eating 27 hot dogs. In the local heroes competition, Las Vegas Metropolitan Police Department defeated Nellis Air Force Base, Clark County Fire Department, Tournament of Kings at Excalibur and Sean E. Cooper of FANTASY at Luxor by eating 30 hot dogs and winning $1,000 for the Injured Police Officers Fund. 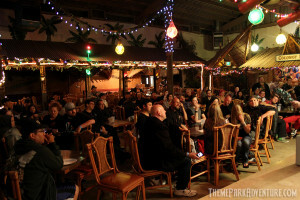 Theme Park Adventure’s Spring Nights at Don’s 2 mixer at Don the Beachcomber brought out lots of fans this past weekend, as we all mixed and mingled the night away in Huntington Beach! Celebrating the mid-way point between winter and summer, TPAers gathered in the mystical Hidden Village at Don’s with potent tiki cocktails in hand – including several first-timers to the event, which we are always thrilled to see! As the Mai Tais flowed like lava from the Coconut Bar, the evening was a buzz of activity – fans, haunters, industry professionals and everyone in between laughed and chatted, as the playing field is always level at our mixers and you never know who you’re going to meet! In less than three weeks, the first LEGOLAND Hotel on the East Coast will officially open. The final bricks are being put in place ahead of the grand opening celebrations on May 15. The Hotel is built for kids and invites them to take the lead from the moment they arrive. A special “kid check-in” takes place in front of the minifigure wall, which is made of 5,000 minifigures. The lobby is also home to a Castle Play area complete with a pirate ship surrounded by a moat filled with LEGO bricks. 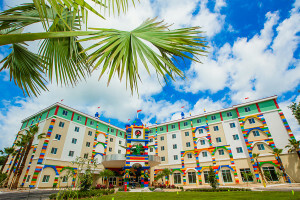 LEGOLAND Hotel offers many unique experiences, exclusive to its guests. Kids can build with Master Model Builders in a workshop setting, go on a scavenger hunt to crack the code on a LEGO treasure chest and uncover special prizes. There’s even a Disco Elevator, where riders can dance under the light of a disco ball as the floor appears to flow under their feet. Each night, Hotel guests can enjoy nightly entertainment including LEGO building contests, or take a stroll on the boardwalk overlooking Lake Eloise. 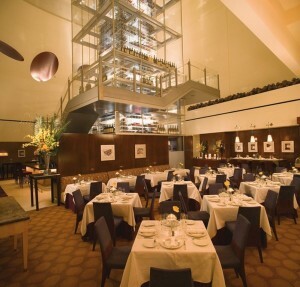 Charlie Palmer’s Aureole at Mandalay Bay will team up with Famille Perrin, the leading organic wine grower of the Southern Rhone Valley, for an exclusive pairing dinner Tuesday, May 26 at 6:30 p.m. Mandalay Bay’s Director of Wine Harley Carbery, along with Proprietor Marc Perrin, will host the event guiding guests through each course with insights into the inspired thinking behind each pairing.